How much should you have saved for retirement? There's actually a simple answer to that. You'll need to start with a bunch of basic assumptions, but all you really need to know is your income and your age. Let's take a look at hypothetical Joe, who is hired straight out of college. By the time he's 25 years old, he's making $40,000 a year. He should have $4,000 socked away in his retirement fund if he wants to retire at age 65. 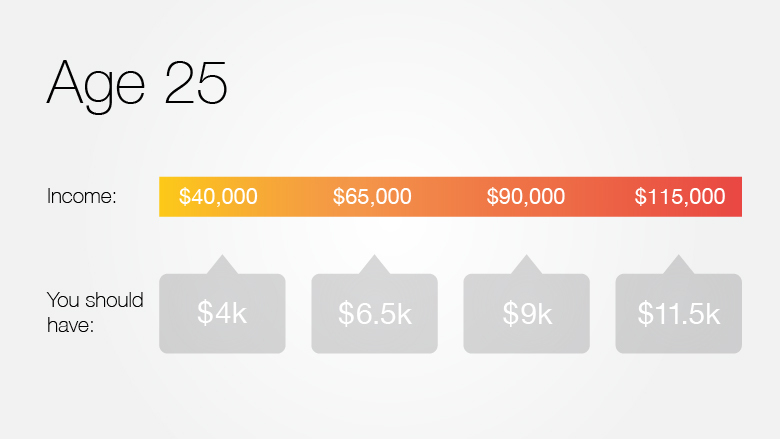 How you can get there: Make sure you're contributing enough to your 401(k) to get the full match from your employer. Source: Calculations come from Charlie Farrell, CEO at Northstar Investment Advisors. Figures target a 70% to 80% pre-retirement income replacement at age 65 for an assumed 30-year retirement. It assumes Social Security will account for 20% of retirement income, a 3.5% return on investments, and a withdrawal rate between 4% and 5% annually in retirement.